Have you been enjoying the Waltzingmouse Sept. release peeks? I know I've had a ton of fun working with these new images, and it's obvious the rest of the team has too by their exquisite projects. Well, I'm excited to share with you what I made with the new Hocus Pocus set. It has the most fun silhouette images (two of which I used on yesterday's project), and some fabulously spooky fonted sentiments!! And then there's the creepy gated fence....LOVE it!! Now, I was thinking...Halloween doesn't have to be just about the kids does it? I mean, have you outgrown your craving for sugary treats? I thought not. So, I thought it would be fun to create a little treat gift box filled with a chocolate goody an adult would love. Have you ever had Ferrero Rocher and Rondnoir Chocolates? YUM!! Anyway, that's what I filled this sweet little box with. Oh, I should tell you how I made the box. Easy as pie!! I used the Spellbinders Square Petal Top Box die. When you emboss it, all the score lines are made for you. I just used a bone folder to make nice crisp folds, and glued it together. I then stamped the fence onto some Fine Linen PTI cardstock, and cut it into panels that fit along the box edges. 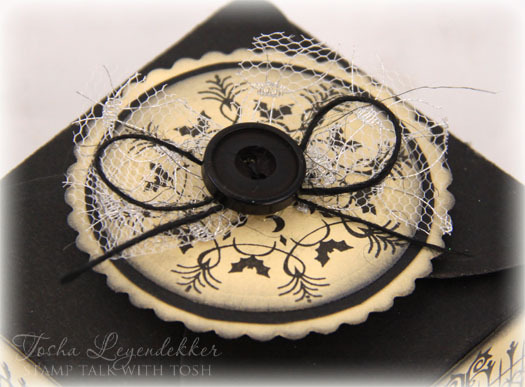 I used the wonderful circular bat/moon image for my medallion topper and added some Webster's Pages Netting behind the button and Black Burlap string. I think it looks a bit like a web. Don't you? Lastly, I filled it with the Candy. Four pieces fit perfectly inside. Oh, I almost forgot, I embossed the "Halloween Wishes" sentiment, with detail black ep, onto one of the side panels too. That's it for my project. I hope you've visited all the other blogs today too. You won't want to miss a one, that's for sure. Thanks so much for all your kind and encouraging comments. It's so generous of you to share your kind thoughts. They are much appreciated. Fab little box! And is that Ferrero Rocher in there?? My fave! Totally gorgeous little box Tosha - SO cool!! Oh My!!! This is absolutely AMAZING! So stylish and cool at the same time! LOVE it! Oh this is just...Oh I love it!!! Och, scrumptious wee box Tosha!!!! So beautifully done!! hugs! Love this box Tosh, the fencing with the sentiment overlay is just gorgeous! Awesome! I want to make this! This deeee-liciously good, Tosh! I love the netting with that fab bat wreath image. Ferrero Rocher? I can barely leave the store before opening those little 3 packs and eating them all myself! Such a sweet treat all around! Your box is perfect! I was wondering what the die looked like when all made up. The picket fence is just the perfect accent image. What an awesome treat box! Great box! I love the netting on the top and the black button. This would make a great teacher gift for Halloween. I just love this box Tosh!! the fence looks super around the sides and your top decoration is wonderful!! What a fun recepticle for treats!! I love this little box, just gorgeous! wonderful details! That treat box for us grownups who never have outgrown the love of candy is so great! Just the perfect size for a sweet tooth and the wrought iron fence fits around it like they were made for each other! So great, wonderful idea today! Oh Tosh, this is great! When I first saw your gorgeous photo I thought to myself that I hope you included a little tutorial for that box.. but its a die! Gotta LOVE that! Fantastic! Love the box Tosha - beautiful work. Love your candy box, very creative, thank you for sharing it. Your project is fabulous! I LOVE that touch of netting you added!!! 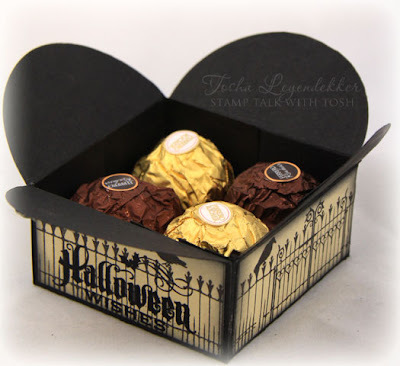 I don't do Halloween but I just love this little box - and we have those chocs in the UK! I'll be looking out for that die. Just perfect for the hard working mums & dads who take the kids out trick or treating!! It's a super box! Tosh, What a pretty box. I love the lacey netting on top! Elegant spiderwebs! What a wonderful little box and you did a superb job decorating it with these terrific new stamps!! Great, great, great box! Did I say it was great? LOL Love this idea. What a neat box! Trick or Treat!!! 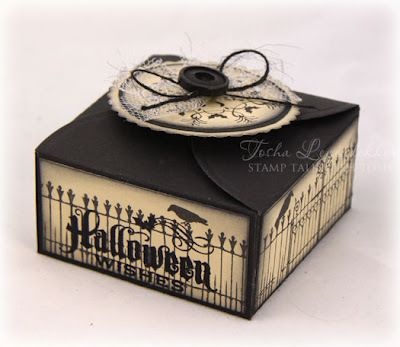 I love this sweet and spooky box! Especially what's inside! LOL! Great little project! Wishing You the happiest of days!